Last week’s Why Mobile Commerce is not Ecommerce 2.0 addressed why mobile is more than just your online storefront formatted to a smaller screen, it’s an integral part of the omnichannel shopping experience. While the content was geared mainly to multichannel retailers, online pureplays aren’t to be forgotten. While not every pureplay will venture into physical spaces like Warby Parker and Bonobos, pureplays and brands selling direct to consumer play a role in omnichannel shopping thanks to showrooming behavior (shoppers using physical stores to check out a product they intend to buy online), while simultaneously being vulnerable to reverse showrooming (using digital for research with intent to buy locally). Digital pureplays can capitalize on both opportunities – snag the showrooming customer using mobile in-store, and intercept the reverse-showroomer to convert digitally through persuasive content and offers and FUD-busting tactics. Google recently reported that smartphone searches now exceed desktop and tablet combined. 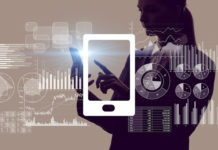 Google’s recent algorithm changes dubbed “Mobilegeddon” mean if you’re not uber-mobile-search-friendly, you’re far less likely to capture showrooming traffic. Make sure you’re not committing any of these mobile commerce SEO sins at a minimum, then get to work at optimizing for “product name + reviews” for at least your top 100 selling SKUs – not only do showroomers actively search for reviews, Google often autosuggests product keywords plus “reviews” as searchers type in mobile search. 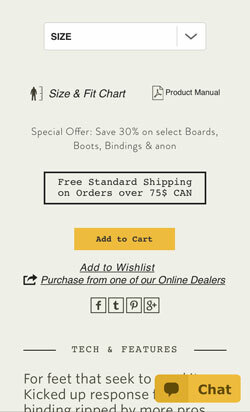 Sierra Trading post is one example of a site that feeds reviews pages to search. Though keywords in the title tag is arguably less of a ranking factor today than in the past, this can be a smart tactic for “reviews” optimization. 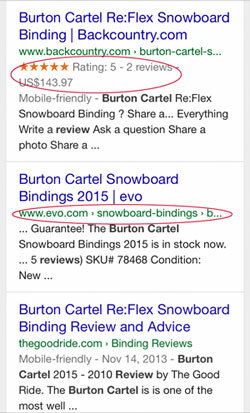 In this example, mobile searchers click through directly to reviews as per their search intent, bypassing product information. Because reviews typically appear at the bottom of product pages, this saves users scrolling, and may reduce bounce-back-to-search-results rate. (Bounce-back-to-search-rate and the time interval between click and bounce is tracked by Google and is a relevance signal for any given page-keyword combination, thus also a likely ranking factor). Don’t forget to optimize your mobile app deep links for search – Google indexes them for Android users. Expose pricing and provide searchers some visual feedback that yummy reviews exist on your product page with rich snippets. 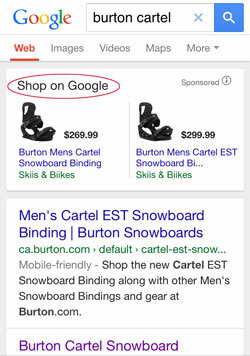 Google Shopping links show product thumbnails at the top of search. ‘Nuff said. Once you’ve won the mobile search click, the persuasion fun begins. For both showroomers and reverse showroomers, you want to clearly communicate your value proposition for why they should buy from your site and not other digital or offline competitors. Whether viewed in portrait or landscape mode, the smartphone screen doesn’t allow much “above the fold” space, so use it wisely. Avoid mega-headers like this, that push most page content below the fold, and leave little room for showing off value props. 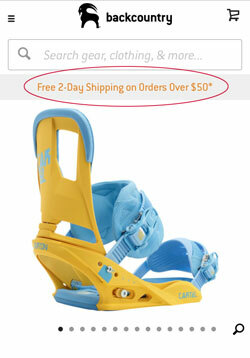 Similarly, avoid burying value props like shipping offers at the bottom of page content, or in menus. Shoppers that prefer buying local often dislike shipping costs and wait time, so mitigating both with a free shipping badge and assurance of super-fast delivery is a great FUD-killer. 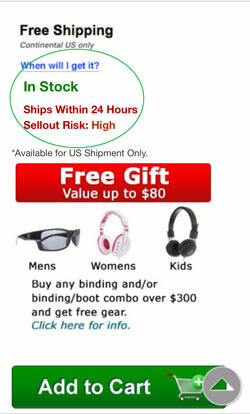 Make sure these offers appear at the top of every page, not just in home page carousels. Remember, most of your search traffic will hit deep pages. It’s not a bad idea to emphasize stock availability, urgency and other perks like gifts with purchase. 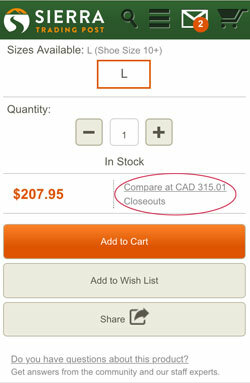 Showroomers love to price compare, so compare prices right on your page. Sierra Trading Post calls out suggested retail price. The House also calls out suggested retail prices, and uses the attention-grabbing, sale-associated color red to do so. 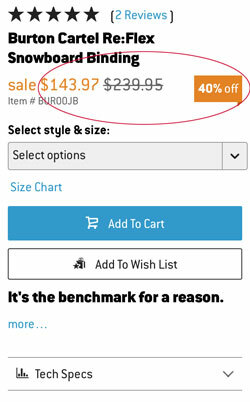 Running actual sales vs. offering coupon code discounts is more usable for mobile shoppers. Coupon codes must be input in checkout, and they’re easy to forget. 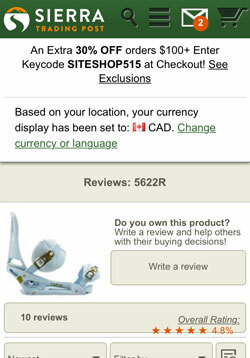 Would you remember SITESHOP515 on your mobile device? This is usability 101, but with ghost buttons so en vogue these days it bears repeating – make your mobile call-to-action buttons clear. 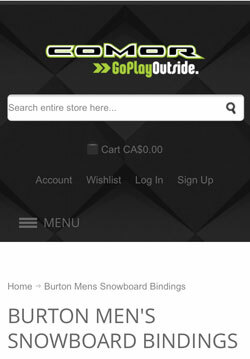 Burton’s cart button visually competes with the Chat button (which is more prominent, and the same color), and the standard shipping callout. 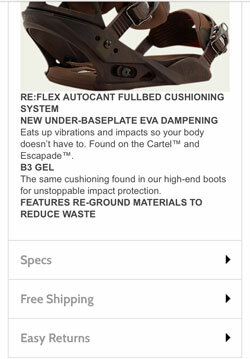 While it’s a stretch to say a motivated buyer won’t find the cart button, it’s risking being too subtle. 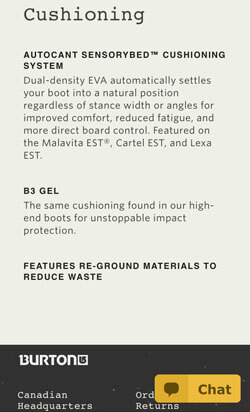 (Also, the value proposition offer of saving 30% is very easy to overlook here). It’s also important to place calls to action in the right places. Repeating the Add to Cart button at the bottom of page content is a good idea, as would be an up-arrow to jump back to the top of the page. Showroomers and particularly reverse showroomers are information hungry, and may visit several sites searching for the best content or to compare prices, and purchase may not happen the same day as research. Retargeting is a great tactic for catching these shoppers during subsequent research sessions, or even as a reminder when they’re hanging out in Facebook or other favorite apps and websites. Site retargeting serves display ads to your site abandoners, and search retargeting hits those that searched for a keyword in your campaign but haven’t visited your site. They’re both worth consideration. 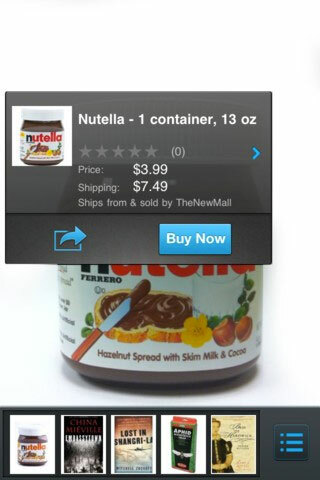 Some retargeting vendors also offer in-app retargeting. While the above are relatively quick-wins, the following take a bit more effort, but can also help you win omnichannel shoppers. 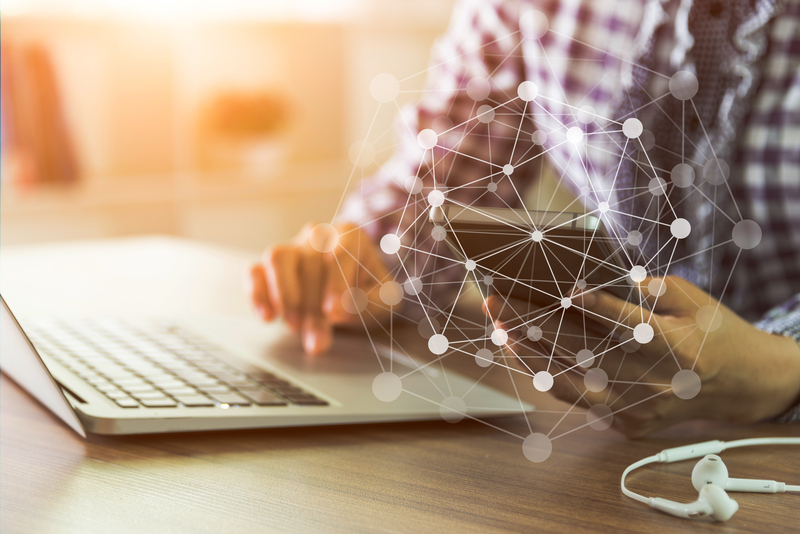 Developing great content and building an engaged community that contributes its own content can help position your site or app as the go-to source for research. Though Amazon may have a high volume of reviews, specialty e-tailers like Sephora and Backcountry’s passionate customer reviews may be more useful and of higher quality than mass-merchant sites. 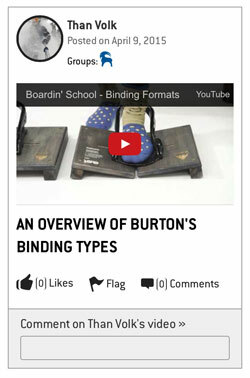 Backcountry has long invested in community features and contributor recognition. 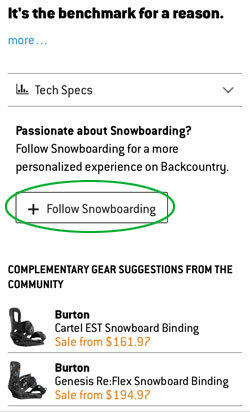 It’s one of the few sites that incorporates community-driven product recommendations, and supports a social-network like way to follow updates within a given category (like snowboarding). 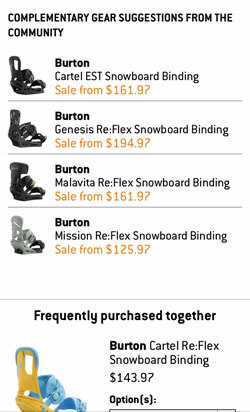 Backcountry also smartly pulls social content into product pages. Great content and/or an engaged community foster trust. Ideally, showroomers have your site in mind to purchase from when they pop into their local shop to try out products. Or, engagement with your site provides brand recognition (and even a personalized search boost) when they’re shopping around using search. In December, we told you to keep your eyes on visual search, and adding image or voice search capability to your site or app supports quicker locating of products than traditional navigation or keyword search. Amazon’s Flow feature already leverages this. Why should Amazon have all the fun (and sales)? Like becoming a killer content resource, adding fun and usable features that help customers showroom better can max your chances of winning the sale. Become the site your customers want to come back to. Whether it’s through an attractive loyalty program or superior post-sale service and surprise-and-delight tactics, don’t let your customers forget you. 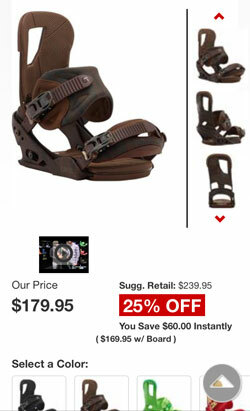 Many showroomers are looking for the best online deal. Dynamic pricing software can help you track pricing for your top bricks-and-clicks competitors to give you the best change of beating them. It’s possible to geofence your competition, mapping your top competitors’ physical locations and pushing time-limited coupons or other offers to your mobile app users. In other words…geosquat. Of course, bricks-and-clicks retailers can also employ these strategies to their mobile sites and apps and glean the same showroom-stopping benefits. But businesses without physical shops don’t have to sit on the sidelines when it comes to omnichannel commerce. Get in the game!